Get a solderless breadboard. Almost any size breadboard will work for this project because there are so few components to place. If you are going to buy a new one then I suggest that you go for an 830 point breadboard. I find this size to be a good compromise and will come in handy for more complex projects later. 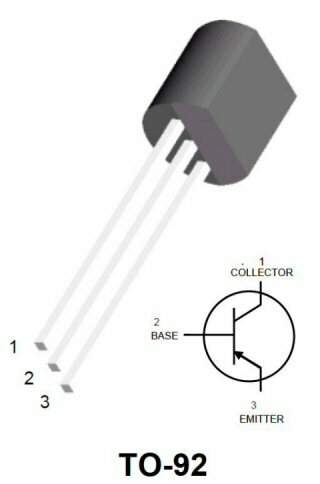 Which type of transistor do you have? 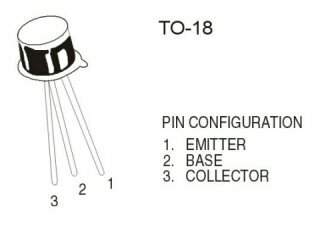 Examine your transistor and make sure that you know which pin is which. You will need to know this so that you can plug it into your breadboard in a moment. Examine your LED. 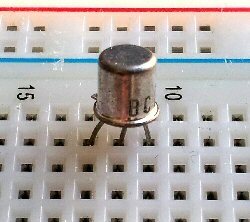 This component must also be placed into your board in the correct way. All diodes including LEDs have an anode (+ve) and a kathode (-ve). The shortest lead. Not much use if you have cut the leads to length. A flat spot on the body. Not always easy to see. 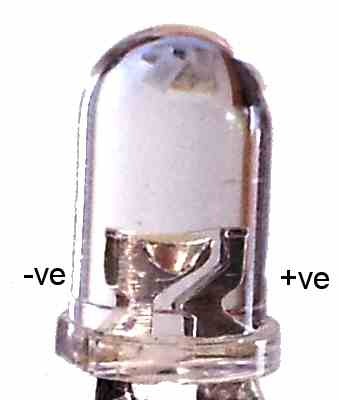 The larger electrode inside the LED. This is not guaranteed but it's how I generally identify my LEDs and it has worked for me every time so far. Remember that the anode should be connected to the positive side of the circuit. Insert the three leads of the transistor into the breadboard with the emitter on the left, the base in the middle and the collector to the right. 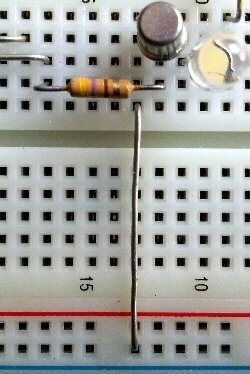 I used 470&ohm; resistors but you can use anything from 100&ohm; to 1k&ohm;. Connect a resistor between the anode of the LED and the positive power line running across the top of the breadboard. 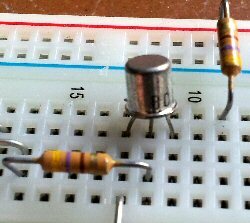 Connect the other resistor from the base of the transistor to a free connection. This will eventually connect to your touch device. Insert the LED with the Kathode lead connected to the collector of the transistor. Connect a wire between the emitter of the transistor and the negative power rail running along the bottom of the breadboard. Cut two longish bare wires to use as the touch sensitive device. You can strip the insulation from solid hook up wire if you don't have any uncovered wire. Place them horizontally and parallel on your breadboard. Connect one of them to the base resistor of the transistor. Connect the other long wire to the positive power line using another piece of wire. 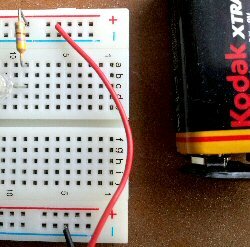 Connect the battery into the circuit. Connect the negative to the lower power rail and the positive to the top one. Place your finger on the touch wires and see what happens. When you place your finger on the two wires that make up the touch sensor you should see the LED glow. 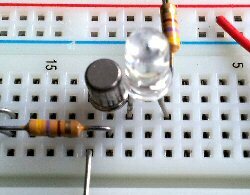 This is due to the tiny current passing through your finger being amplified by the transistor to deliver a larger current into the LED. See what happens when you press harder on the touch wires or when you dampen your finger before touching. 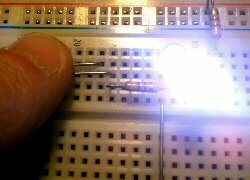 If you see the LED glow brighter then it's because you are conducting more current into the base of the transistor. You have just built a very simple touch switch that uses a single transistor. We could make the circuit more sensitive by adding another transistor to increase the current gain or amplification. That is for another day however.